Hybrid figures are among my favorites. Here i present two Vertical Nets that incorporate moves from my Ten Men system. This figure was invented by my friend Keith Kaplon. It starts with a Ten Men loom, which is then modified and rearranged to give a Vertical Net Loom. Two V-1 weaves follow, but the lowest far index string is skipped. 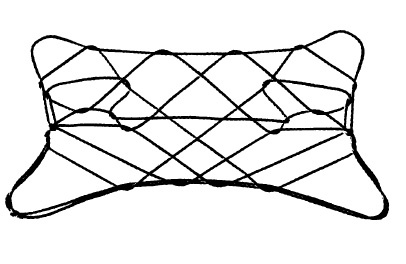 The figure ends with a series of reverse V-2 weaves, which Kaplon called the “Dipsy- Doodle.” Use a loop made from a string measuring 2½ spans. •	Ten Men Loom (Opening A; With your mouth reach over all the strings and return with the far little finger string; With your right index reach over the right mouth string, pick up the left mouth string, and return; With your left index pick up the right mouth string and return; Release the mouth loop and the loop on each thumb and extend). •	Do an a weave without resetting the loom (Pass each thumb under the index loops, pick up the near little finger string, and return. With each thumb pick up the upper near index string, then Navaho the thumb loops). •	With each little finger pick up the upper far index string and return. Drop the upper index loop and extend. You now have palmar strings. •	Now do a modified Opening A: With the right index pick up the left palmar string (segment near left thumb); Pass the left index down through the upper right index loop only and pick up the right palmar (segment near right thumb). Return, but do not wriggle (see-saw) hands to absorb slack. •	Transfer the thumb loop to the top of the index, inserting the index finger from below. Two loops hang from the upper near index string. 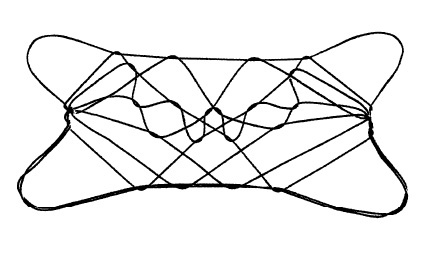 [Two loops hang from the upper near index string (fig.15). Each loop is a continuation of the lower far index string. Behind these two loops hangs a single transverse string, this being a continuation of the lower near index string. •	Pass each thumb away from you, through the hanging loop nearest it, and pick up the single transverse string, drawing it through the hanging loop]. Now wriggle hands to absorb slack. •	With each thumb pick up the upper near index string, then Navajo the thumb loops, drop the upper index loop, and transfer the thumb loop to the top of the index, inserting the index from below. •	Pass the thumb under the index loops, transfer the double little finger loop to the thumb, then immediately re-transfer this loop to the middle-ring-little fingers, inserting them from above and pressing their tips to the palm. You now have a modified Vertical Loom. •	Pass each thumb up behind the strings and insert it, from below, into the middle index loop. With each thumb hook down the middle far index string and draw it down through the double middle-ring-little finger loop until the thumb is below the double far little finger string, then with each thumb pick up the double far little finger string and draw it through the loop on each thumb, which slips off as you return. •	Drop the double middle-ring-little finger loop and extend. •	Transfer the double thumb loop to the middle-ring-little fingers by inserting the three lesser fingers from below, closing the double near thumb string to the palm, and withdrawing the thumb. •	Pass each thumb under all the index loops and away from you through the double middle-ring-little finger loop. •	Pass each thumb up behind the strings and insert it, from below, into the upper index loop. With each thumb hook down the upper far index string and draw it down through the double middle-ring-little finger loop until the thumb is below the double far little finger string, then with each thumb pick up the double far little finger string and draw it through the loop on each thumb, which slips off as you return. Transfer all index loops to the thumb, maintaining their relative order. 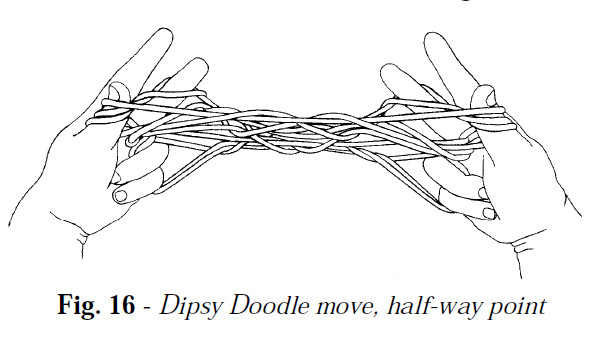 In the Dipsy Doodle sequence, the near thumb strings are woven from bottom to top without releasing any loops from the thumb until all three strings have been woven: First, insert each index and middle finger, from above, into all three thumb loops, pass their tips in front of the lowest near thumb string, then pinch the middle near thumb string between them (index above, middle finger below) and draw this string up through the thumb loops without rotating their tips away from you and up. You now have a loop on each middle finger (fig. 16). Next, insert each index, from below, into the middle finger loop and pinch between their tips the remaining near thumb string. Draw this string away from you, through the index-middle finger loop, by rotating their tips away from you and up, catching the retrieved string on the back of the index. Release all three thumb loops and extend. If desired, apply the Power Lift or Caroline Extension. Ten Men Loom, a without resetting loom, transfer upper index loop to little finger, index picks up opposite palmar string (near thumb) as in opening A, lift thumb loop to top of index, thumb through hanging loop gets hanging transverse, wriggle, thumb picks up upper near index string, Navajo thumbs, drop upper index loop, transfer thumb loop to index, three lesser fingers take little finger loop from behind, [V-1, skipping lowest far index string]2, [reverse V-2, done dipsy doodle style]2 (Power Lift or Caroline Extension). 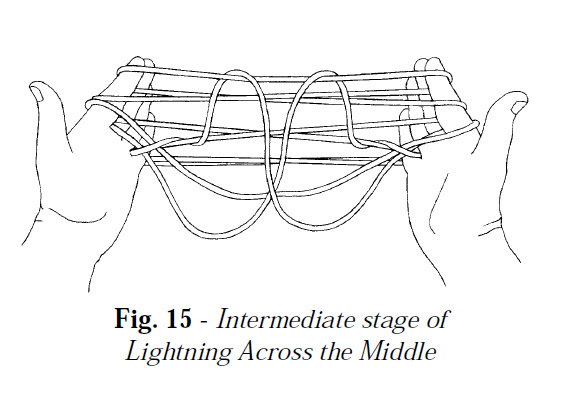 This figure, also invented by Keith Kaplon, is a less complex version of Lightning Across the Middle. Since thunder often follows lightning the name Thunder Across the Middle seems appropriate. Ten Men Loom, a without resetting loom, transfer upper index loop to little finger, index picks up opposite palmar string (near thumb) as in opening A, lift thumb loop to top of index, wriggle, thumb picks up upper near index string, Navaho thumbs, drop upper index loop, transfer thumb loop to index, three lesser fingers take little finger loop from behind, (V-1, skipping lowest far index string]2, [reverse V-2, done dipsy doodle style]2 (Power Lift or Caroline Extension). 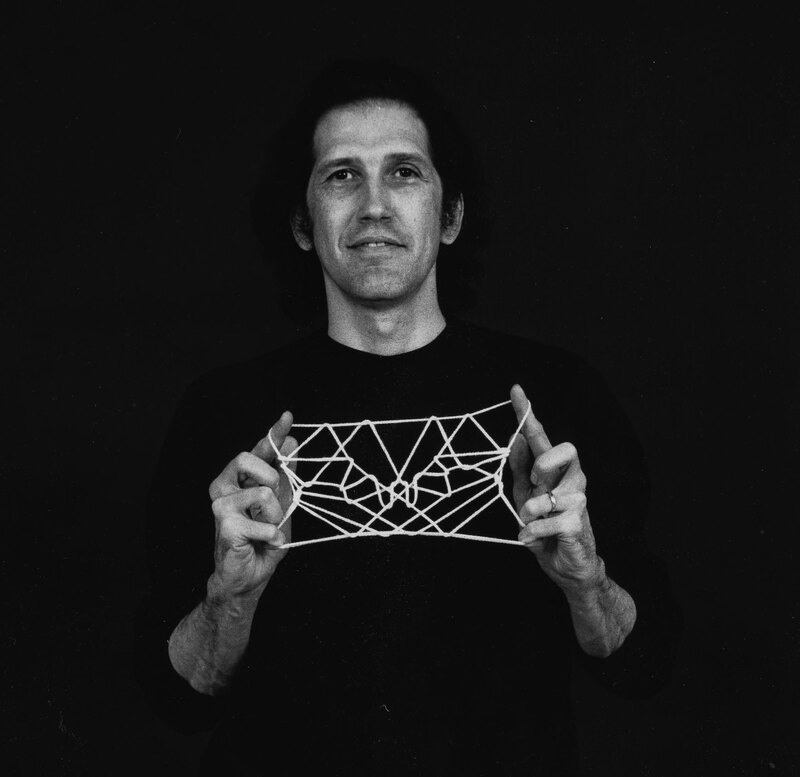 As humans our five fingers limit the number of loops we can manipulate while weaving string figures. Nauruans, who routinely employed 5-loop looms to create their most intricate designs, showed us that “more” is often “better” when weaving string figures. Vertical looms allow us to easily manipulate more than five loops. 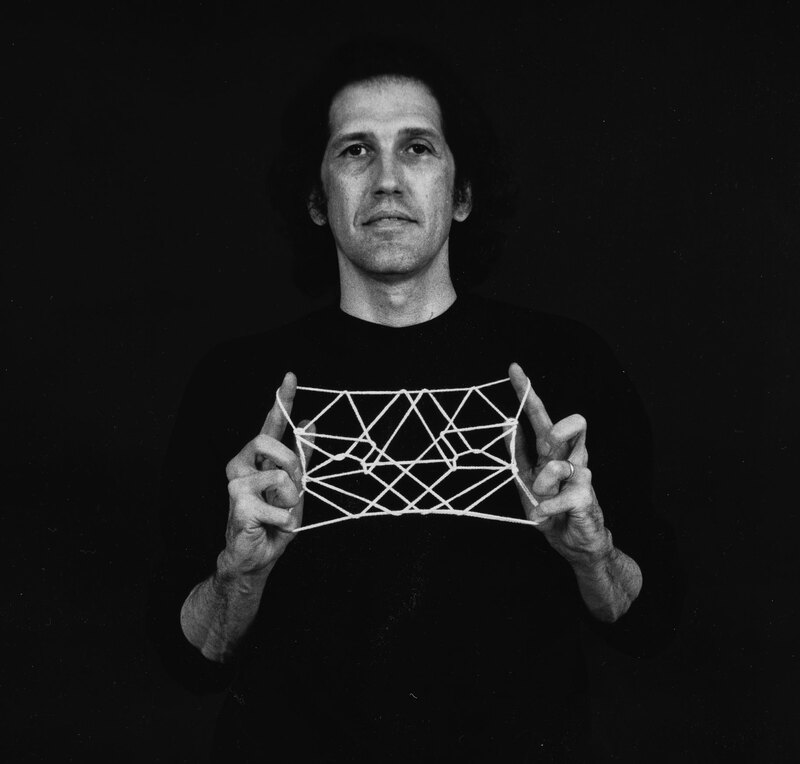 In fact, the number of loops is limited only by the length of your string and the length of your index finger.